Fiji with its capital Suva is located in Oceania (Oceania, island group in the South Pacific Ocean). It covers some 18,275 square kilometers (slightly smaller than New Jersey) with 920,938 citizens. English and Fijian are the languages commonly used by the people in Fiji. This country shares no land borders with another country. Fiji is a Melanesian country in the South Pacific Ocean. It lies about two-thirds of the way from Hawaii to New Zealand and consists of an archipelago that includes 332 islands, a handful of which make up most of the land area, and approximately 110 of which are inhabited. Fiji is the product of volcanic mountains and warm tropical waters. Its majestic and ever-varied coral reefs today draw tourists from around the world. Climate: Tropical marine; only slight seasonal temperature variation. Tropical cyclonic storms (The South Pacific version of Hurricanes) can occur from November to April. Temperature sensitive visitors may wish to visit during the Southern Hemisphere winter. The landscape is mostly mountains of volcanic origin. The average density of population is about 50 per km². The climate in Fiji can be described as tropical marine with only slight seasonal temperature variation. Potential threats by nature are cyclonic storms can occur from November to January. To reach someone Fiji dial +679 prior to a number. The local cellular networks are operated on 900 MHz, 3G, 4G. Websites typically end with the top level domain ".fj". If you want to bring electric appliances (e.g. battery chaarger), keep in min the local 240 V - 50 Hz (plugs: I). The sign for the locally used currency Dollar is FJD. 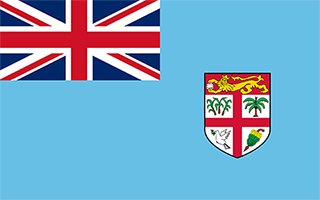 Light blue with the flag of the UK in the upper hoist-side quadrant and the Fijian shield centered on the outer half of the flag; the blue symbolizes the Pacific ocean and the Union Jack reflects the links with Great Britain; the shield - taken from Fiji's coat of arms - depicts a yellow lion, holding a coconut pod between its paws, above a white field quartered by the cross of Saint George; the four quarters depict stalks of sugarcane, a palm tree, a banana bunch, and a white dove of peace.